PACKAGE THIS TITLE WITH OUR 2016 MLA SUPPLEMENT, Documenting Sources in MLA Style (package ISBN-13: 9781319084868). Get the most recent updates on MLA citation in a convenient, 40-page resource based on The MLA Handbook, 8th Edition, with plenty of models. Browse our catalog or contact your representative for a full listing of updated titles and packages, or to request a custom ISBN. Andrea Lunsford’s research treats student writers as writers first—not only in the classroom, but in every aspect of their lives. Her newest handbook features a simple and inviting design that helps students find solutions for every situation as they translate their skills as writers in their day-to-day lives to the conventions of solid academic writing. 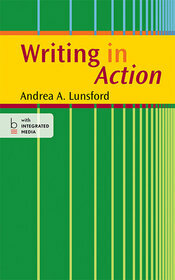 Featuring the writing process coverage of larger handbooks at a value price, Writing in Action is a supportive reference that emphasizes rhetorical strategies that help students put their ideas into action.